OK, this recipe might have you scratching your head when you read the ingredient list--smoked almonds, ginger and coconut milk along with soy sauce and brown rice vinegar might seem like an odd combination for a pesto but it is the genius of Eric Gower and one of my favorite cookbooks, "The Breakaway Japanese Kitchen: Inspired New Tastes ." If you can find a copy of it or his other more recent book, "The Breakaway Cook: Recipes That Break Away from the Ordinary ," I highly recommend them both. 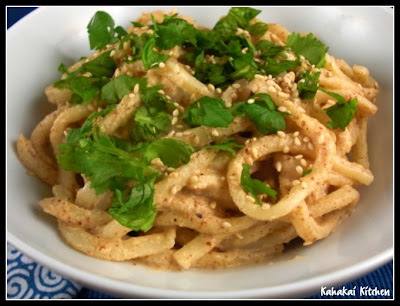 The guy is a master of mixing diverse ingredients and flavors to create unique, tasty dishes, and this Asian Pesto Udon is a great example. I know you were probably expecting a big bowl of Ramen to represent this month's Food N' Flix film Ramen Girl but I've been there, done that. 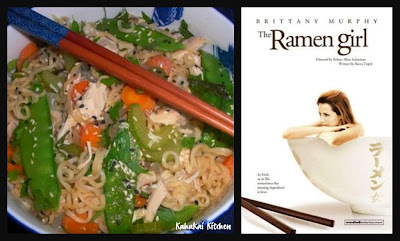 I first saw this movie about a year and a half ago and did a dinner and a movie post with a Tyler Florence ramen recipe here . Gower says, "A satisfying and easy sauce that can be made in less time than it takes to boil the water. It's equally good hot or cold. Hot version: heat the sauce, serve over hot udon. 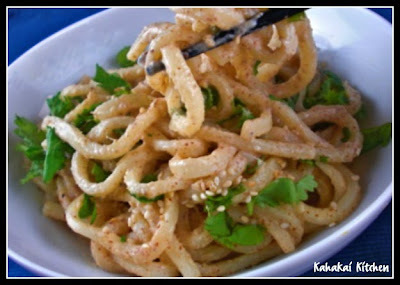 Cold version: make the sauce, chill it, plunge the just-cooked noodles into ice water, and mix. Either way it's nice with a chilled glass of dry riesling or semillon blend." Set a pot of water to boil for the udon. Combine everything except the cilantro in a blender and blend. When the water boils, add the udon and cook until al dente, and then drain. Transfer the sauce from the blender to the pot, add the udon, and mix. Taste for salt, top with the cilantro, and serve in warm bowls. Notes/Results: A little smoky--I used "smokehouse" almonds, a little kick of ginger and creaminess from the almonds and the coconut milk, this is a unique sauce that tastes great on the thick noodles. I tried it both hot and cold and I am not sure which way I like it best--texturally I preferred it warm, but some of the flavors like the ginger seem to come out more when it is cold. I liked this a lot, it is different but really good. The sauce, thinned out a bit would make a great dressing too. So quick, easy and flavorful, I will make this again. So, a review of the movie? Here's what I said in my original post (I'll be honest--I didn't watch it again): "A girl needs a good chick flick now and then, something light and fluffy, where you don't have to think--a feel good movie. I ended up needing one last Friday; I was tired, grumpy, stuffy from allergies and needed a low-effort evening. In one of my Netflix envelopes was "The Ramen Girl", a total chick flick, and seeing the name of the movie made me crave some ramen to eat while I watched it. Brittany Murphy is Abby, an American alone in Tokyo after her boyfriend breaks up with her and leaves her stranded there. Finding comfort in a bowl of hot ramen from a noodle shop across from her apartment in Japan, and searching for some direction in life, she trains to be a ramen noodle chef under the tutelage of the surly and usually drunk owner and ramen "master". It's not the best movie you'll ever watch, it is complete fluff; the acting just OK, the story improbable at best, but it is sweet and cute." I am also sending this easy unique pasta dish to Presto Pasta Nights, hosted this week by its fabulous creator, Ruth at Once Upon A Feast. 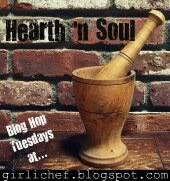 And I'm linking it to the Hearth 'N Soul Blog Hop hosted by hosted by my pal girlichef as well as A Moderate Life, Hunger and Thirst, and Frugality and Crunchiness wth Christy, and Alternative Health and Nutrition News. I didn't see the movie but your udon dish is so intriguing that I'm definitely going to try some of that. Thanks for sharing with Presto Pasta Night. It's always fun when you do. A purist though I may be about some things, I could never turn down any kind of pesto. Especially if it involves coconut milk and cilantro! This sounds so delicious deb! I can't wait to try this dish! I this it sounds great! I am bookmarking this and making it for sure! I love fresh udon noodles in the refrigerator, I have some there now. Often my lunch! Okay...corection...I was so busy trying to finish so I could bookmark this page that I didn't re-read my comment until it was too late. I meant to say "I think it sounds great". Food 'n Flix, how have I never heard of this!!! Pesto made with smoked almonds? Awesome! I love that idea. You take the most professional photos I have ever seen in a blog. I am so impressed! 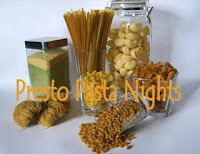 By the way, is it an invitation only thing for Presto Pasta Nights? Coconut milk in pesto is new to me, but it sounds great :) Simple too. I knew that you would find an inventive recipe for this month's food 'n flix. This asian pesto delicious with the smokiness of the almonds. Great pick! Have you seen the cartons of coconut milk in the milk containers yet? Just noticed them the other day, thought of you, and bought one for myself. 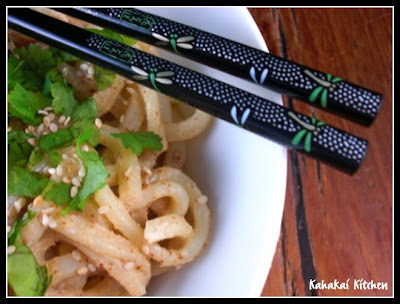 I love a noodle dish - I prefer mine warm - they just seem to need to be warm in my opinion. What a great dish - I love the sauce ingredients and the smoked almonds sound delicious! thanks for sharing this with the hearth and soul hop! Hmm that's an interesting pesto, sounds very good, though. And thanks for the review of the movie. I don't like chick flicks, but if I'm in the mood I'll watch it with a date. Hehe. wow, this looks so tasty ... 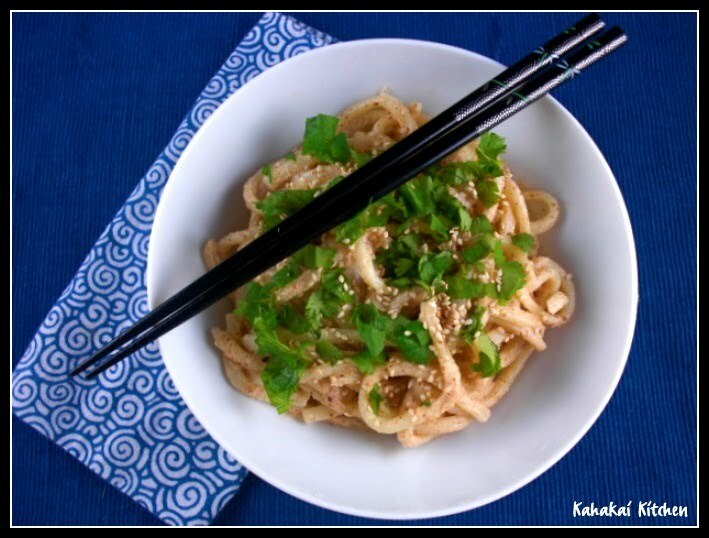 I think udon noodles might be my favorite but I have only used them in "stir-fry" type dishes. I love that you used it another way! This pesto is really interesting. Sounds like some great flavors. Love dishes with an Asian spin. Delicious pesto, I love how original it is. Pine nuts don't do anything for me, so I am always open to new spins on pesto. unusual collection of ingredients too.. This is one of my favorite movies! And I love the pesto - so unique - and eating it hot or cold is a bonus - I can eat it straight from the fridge! I'd love to watch Ramen Girl. That udon's very tempting. I Want to Be the Next Iron Foodie 2010!